This was the year that Robert and I had decided to just break down and buy a Halloween costume. It's been a rough start to the school year, and we've been a little overwhelmed so finding the energy to think up how to construct a costume seemed too much. 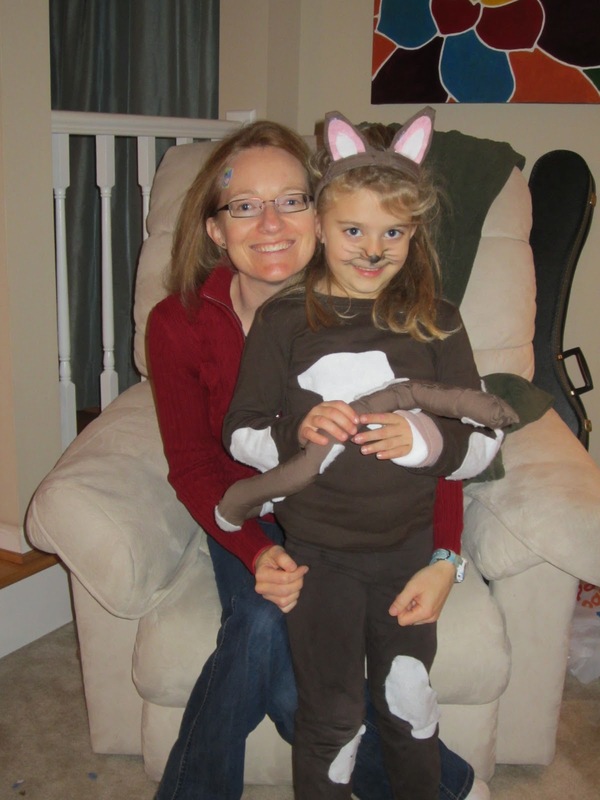 And then, our little angel decided to be a "brown kitty, just like her stuffed animal." Do you know that stores sell black kitty costumes but not brown kitty costumes? - for the ears, hot glue the brown scrap fabric to the headband; cut out cardboard into the shape of ears with a flap to hot glue to the headband; cover the cardboard with brown fabric; hot glue the white and pink felt.